Not for nothing are the Comoros known as the Perfume Isles. They export around 80% of the world’s supply of ylang ylang essence, an essential oil that is the main ingredient of most expensive perfumes. Originally from the Philippines, the ylang ylang plant was introduced to the Comoros by the French in the late nineteenth century. Like vanilla and cloves, which are also grown in the Comoros, ylang ylang is a potentially lucrative crop that is subject to volatile markets. Even while still growing on the tree, the yellow flower has a strong, sweet fragrance which will eventually be used in perfumes, soaps and other toiletries. Walking through the fields with your eyes closed is like walking past a perfume counter in a big department store. The flowers are picked three times a month, giving distilleries an income all year round. The flowers are placed in a vat and steamed. The steam rises into a pipe and is fed into a condensing chamber where it cools. 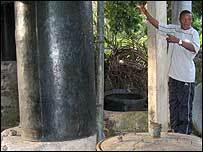 The perfume essence is then collected at the bottom of the chamber. It takes 100kg of flowers to produce three litres of essential oil and the distillation process alone goes on for 18 hours. In the treatment room, the oil is checked for impurities before it is put into barrels to be exported to France. The distillery does not just deal with its own crop of ylang ylang flowers. It buys quantities from small, independent farmers on all the islands of the Comoros, combining their lesser yields into a larger crop. The exportation of essential oils and spices is a closed market and every exporter must be licensed for each crop, with separate permits for the export of ylang ylang, vanilla, cloves and pepper. Hassan Assoumani, manager of the Comore Vanille et Plantes distillery and export business in Mbeni on the main island of Grande Comore, says small-scale farmers do not have the money or expertise to distil the essence. Maintaining high standards is important, but this does not make life any easier for the small-scale essence producers of the Comoros. 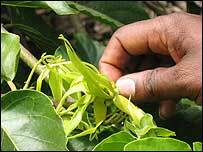 Abderramane Amada is the son of an ylang ylang farmer near the town of Iconi on Grande Comore. The family has its own traditional wood-fired distillery and makes money by selling bottles of essence to tourists. “It’s not a lot of money but I will continue making it,” he said. He may be struggling but at least Mr Amada is not dependent on the international popularity of expensive French perfume for a sweet-smelling future.